There are several options that you may use as the substrate for your pet’s enclosure, such as the following: sand, sand mixed with soil, forest bedding or coconut fiber, crushed coral, gravel, small pebbles, potting soil, and wood chips. Not all of these substrates will be beneficial for your pet hermit crab as some of them may not be good enough for burrowing or digging. 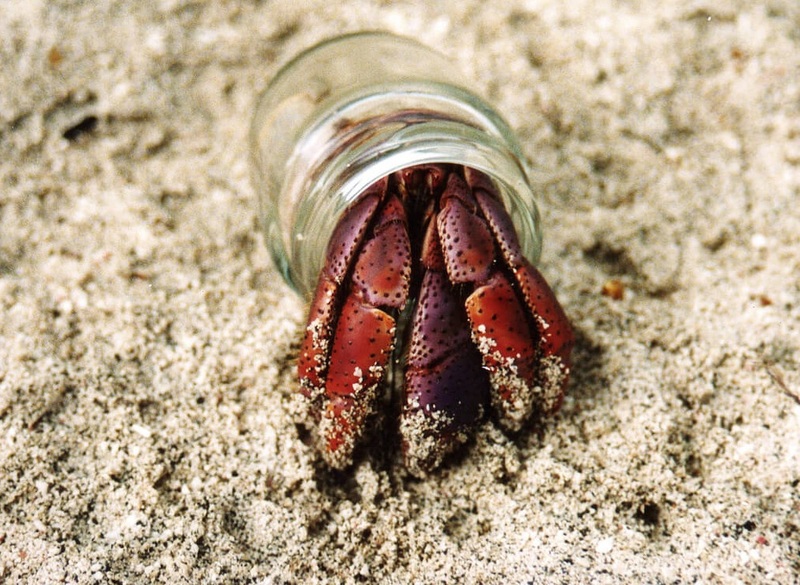 Others may not hold moisture, as well as others, can, and some may just endanger your hermit crab. Hermit crabs are used to walking and burrowing on the sand in their natural habitat. It is also a cheap and easily available option that you can place in your pet’s enclosure. If you do decide to use sand as a substrate for your pet’s housing, make sure that it is safe enough for your pet to dig and chill in. Check for small insects, bugs, or anything that can possibly harm your pet. It will be a good idea to clean and bake the sand as well before placing some good amount of the sand into your pet’s enclosure. It should also be kept moist enough to help keep the humidity level within the enclosure safe enough for your pet. Just make sure that it’s not too watery that your pet will find it difficult to dig into it. This is also an excellent substrate for your pet’s enclosure. Unlike the sand substrate, coconut or fiber or forest bedding does not collapse completely in newly molted crabs. This substrate also has a better moisture-holding capability than the sand. However, forest beddings are found to be an ideal breeding ground of fungus gnats. Some have found adding some salt water into the substrate and cleaning and sterilizing the tank regularly to have solved the problem. You can also combine the two substrates for a more comfortable bedding for your hermit crab. As your crab will always be moving about (burrowing and tunneling) its tank, as well as the accessories in it, will get dirty quite often. That means you will need to have the tank and the everything in it properly cleaned regularly to keep your hermit crab safe and healthy. Not all substrates can be used in your pet’s enclosure. Small river pebbles, potting soil, wood shavings, and anything that may have very rough surfaces may harm your pet and should not be used as your hermit crab bedding. They don’t hold much moisture as well and water may just be collected under these substrates. Corn, pine, and cedar shavings are extremely hazardous to hermit crabs and should not also be used as substrates for your pet’s enclosure. Your hermit crab will be either be resting or digging around the substrate, so you need to make sure that the substrate or bedding that you will use will be safe enough to keep your pet not only protected but also satisfied.